≈ Comments Off on Passover and Easter…Veganized! That’s exactly what my car looks like in the spring here in Charleston. Not like I can talk though here in Charleston. Our “winter” is a Northerner’s dream. Still, I’m ready for the spring and all it brings (except for the pollen. I’m never ready for th…. Achooooooooo!). For Jews, spring brings the holiday of Passover with its matzah, matzah, and more matzah, plus a friendly visit from Elijah the Prophet. For our Christian friends and family, spring comes hopping forth in the shape of the Easter bunny, bearing gifts of chocolate eggs. You would think that the Passover seder – with its lamb shank, egg, and matzah ball chicken soup – couldn’t be veganized. But think again! Then there’s Easter with its egg decorating, Easter egg hunts, milk chocolate bunnies, and mayonnaise filled lunch. Surely that can’t be veganized. Oh yes it can! Come on, I’ll show you how both holidays can be celebrated fully minus the animal products. Passover is the Jewish Festival of Freedom. It provides us the opportunity to remember our redemption from slavery in Egypt and celebrate the freedom we have. Because Passover spotlights freedom, it is also a fantastic opportunity to focus on the parallels between the Passover story and modern struggles for freedom. Since 99% of the meat and animal products we consume come from factory farms, places where animals are intensely confined and raised just to be killed, animals certainly have a fight ahead of them for freedom. And since we don’t speak their languages and they don’t speak ours, they need people to help them. And you can help them! By participating in Meatless Monday, eating vegetarian, or being vegan – or even just hosting a vegan seder! – you consume fewer or no animal products, driving down demand and eventually supply. What great power to have! The seder, a symbolic meal where we recount the story of Passover, is our main way we celebrate the holiday. And a seder can be totally veganized. See this handy dandy VegNews guide to a vegan Passover seder. The traditional seder plate has many symbolic items on it, among which are a shank bone, representing the paschal lamb, and a roasted egg, standing for spring and renewal. A vegan version of a seder plate though will have a beet instead of the shank bone (which is permitted in the Talmud) and an edible flower or perhaps a decorative ceramic egg instead of a chicken’s egg. Creative, huh? Vegan matzah ball soup from the Post Punk Kitchen – I won’t lie. I cried two years in a row trying to make vegan matzah balls. There was a learning curve. But it CAN be done (without tears) if you follow the directions carefully. (Note: this recipe contains tofu, made from soybeans. Not all Jews choose to eat soy on Passover; here’s another recipe without soy (which I haven’t tried)). 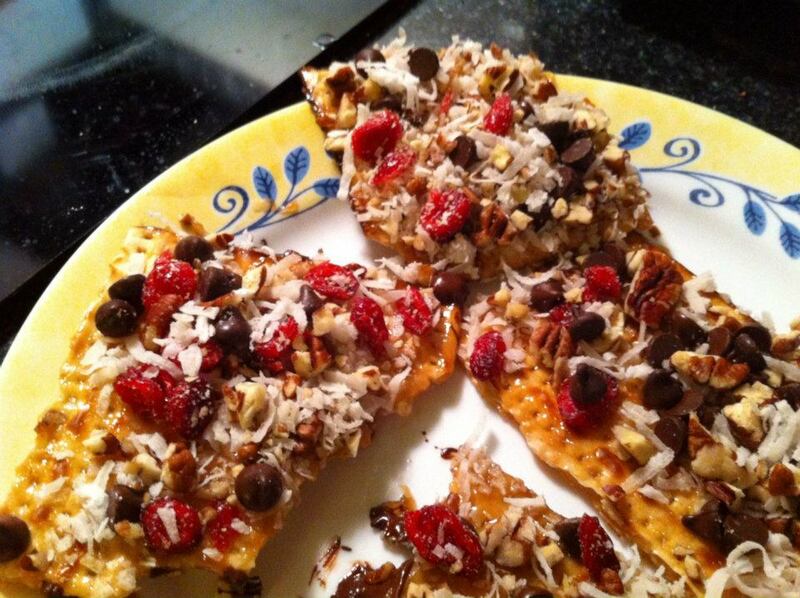 Chef Chloe’s Matzah Brei – Who doesn’t love a yummy, savory brei? A big list of recipes from PETA, including carrot tzimmes, chopped “liver” spread (which sounds gross but is AMAZING and super easy), sweet potato kugel, eggplant casserole and more. Potato-Mushroom Kugel – I ♥ mushrooms, and this is an easy recipe. Mock Gefilte Fish – ‘Cause who wants to eat the real stuff anyway? Ew. I actually have my own dessert recipe to share with you! Admittedly, I’m one of those people who loves matzah. I start hoarding containers of vegan cream cheese to spread on it at all times of day well before Passover starts. So, here’s a dessert that makes matzah into a gooey, crunchy sweet treat. Preheat the oven to 350. Line a cookie sheet with wax paper or aluminum foil and place the matzah boards on it. Melt the Earth Balance and brown sugar together in a saucepan over medium heat. Whisk it together ’til it’s smooth and melted. Pour the mixture over the matzah, covering it completely (you might want to spread it using a spatula so it’s evenly coated). Bake it for 8-10 minutes. Now, on to the next holiday! Easter is the Christian holiday that celebrates the resurrection of Jesus after his crucifixion. It’s a joyous holiday celebrated with services, Easter parades (side note: I love that movie with Judy Garland and Fred Astaire! ), and Easter egg hunts. To be honest, I don’t really know how the Easter bunny and eggs got into the celebration, but it doesn’t matter. They’re there and they’re fun! So let’s veganize them! To veganize Easter traditions, we first have to replace the chicken’s eggs that are ubiquitous in the celebrations. Don’t worry, this is easy to do. For dyeing eggs, there’s a product called EggNots! These are ceramic eggs that look realistic, are dyeable, and provide all the family togetherness of decorating eggs with none of the cruelty. These can be used for Easter egg hunts too, or you can use those plastic eggs that can be found just about everywhere (but the ceramic ones are probably more eco-friendly). The Easter bunny needs something to bring the kiddos, though. Is there vegan Easter candy? You’ll be sorry you asked, there’s so much! From vegan Peeps to vegan Cadbury style eggs, there’s a plethora of vegan Easter candy. Below are pictures (that link to the products) of only a sampling that’s out there! If you’re feeling ambitious, you can even make your own! Here’s a recipe. Hippity hop to Veganville with this Allison’s Gourmet chocolate Easter bunny and eggs! And what about Easter lunch? I’ve collected some recipe ideas for this too that I think you’ll love! Spring Greens Salad with Endives and Oranges – a beautiful start to a meal! Tofu Quiche with Mushrooms and Herbs – this just has “Easter lunch” written all over it. 30 Vegan Easter brunch ideas from Healthy Happy Life, including Easter Swirl Lamb Cake, fluffy spiced quinoa, lemon leek pesto penne, and more! Once again, I have my own recipe to share with you. This one is for creamy, tangy potato salad – perfect for an Easter lunch! Boil the potatoes until just tender. Drain and rinse under cool water to stop the cooking process. 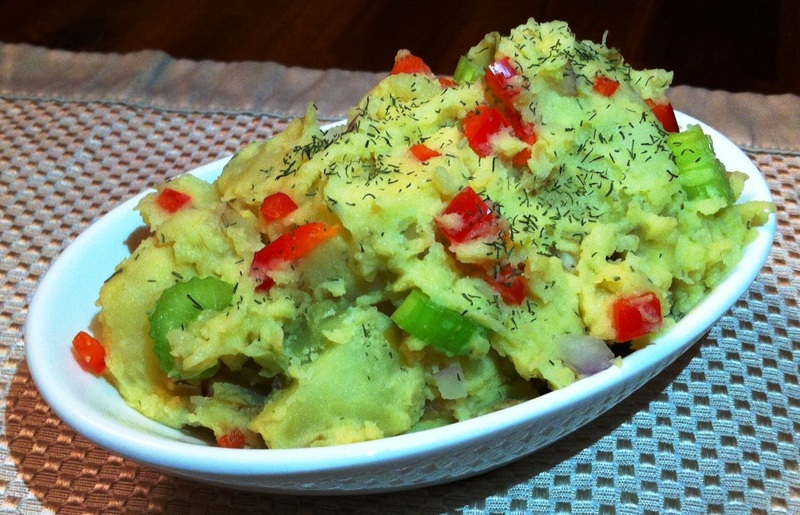 In a large bowl, mix the potatoes with the vegan mayo, mustard, salt, garlic powder, dill and pepper. Fold in the veggies, and refrigerate to cool. Sprinkle with dried dill, then serve! Easy peasy. I hope the above helps you veganize your Passover or Easter celebrations. It really is possible to fully participate in the holidays while leaving out the animal products that are produced in cruel ways that are against the meaning of both holidays anyway.